Sometimes, a picture is worth more than words can describe. September 11, 2001 began as a serene Tuesday morning that quickly turned into one of the darkest days in American history. Fourteen years later, the New York skyline and the Pentagon still reveal unthinkable images of gigantic planes crashing into buildings, causing destruction and fire with billowing clouds of smoke, brave people running for cover and heroes running into danger. It’s difficult to put into words what we all felt that day, including the personal connections to people in those cities and on those flights that day. And those who were almost there. The awe-inspiring picture above (showcasing one of nature’s best tricks) doesn’t heal the pain from September 11, 2001. However, after so many years, still with a feeling that it just happened, it does offer a small glimmer (and sign) of hope for the future as a rare double-rainbow shines over New York City with the One World Trade Center and an American flag perfectly in frame. 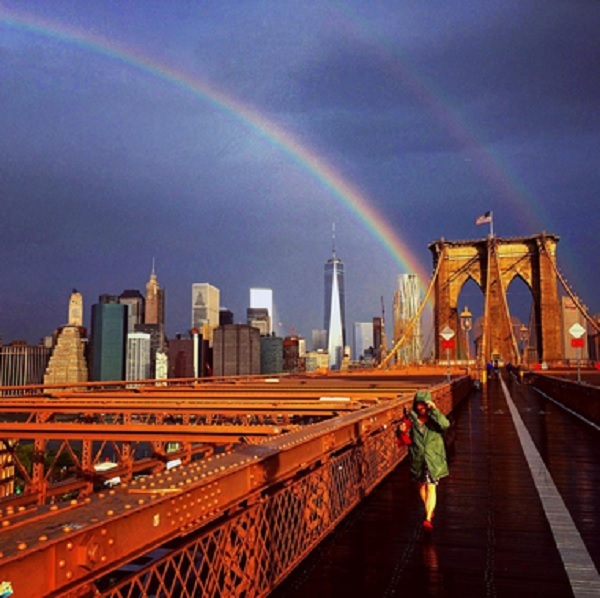 Posted on September 11, 2015, in Uncategorized and tagged 9/11, hope, inspiring, picture, rainbow, September 11 2001, tragedy. Bookmark the permalink. Leave a comment.